It’s very tempting not to summarise the book at all, because there’s no way a summary could do this gem any justice. It is a story about some fairly low-key romances that happen in an obscure, oppressively hot, mostly barren part of the world – doesn’t sound very good so far, does it? But somehow Grenville manages to say so much about relationships and love and life that the book has a secretly broad reach and counts as the most satisfying novel I’ve read in a long time. Karakarook is a small town in New South Wales with a main road ‘wide and empty as an airport runway, lying stunned under the sun’ and a population of 1374, plus two visitors – Douglas Cheeseman, a jug-eared engineer with a fear of heights, bovine animals and all social situations, who has come to pull down a quaint old bridge; and Harley Savage, a robust woman from Sydney, three times married, with a self-confessed dangerous streak and a dicky ticker, who has come to supervise the creation of Karakarook’s heritage museum. When the two meet – in a field of angry cows – it is hard to imagine how romance will ever blossom between them, but the Da Vinci quote that inspired Grenville to write this novel says a lot without giving the details of this wonderful story away: ‘An arch is two weaknesses which together make a strength’. Divorcee Douglas Cheeseman has an inkling that there is life beyond Engineering Digest but he lacks the courage to look over the edge and step into the unknown, while Harley Savage has been weighed down with a guilt so profound that she won’t even lower her guard to a local dog who insists on being her best friend despite her efforts to get rid of him (I always trust a dog’s judgement, personally). Then there is a glorious sub-plot provided by beautiful Felicity Porcelline, the bank manager’s wife – ‘There was absolutely no reason why she should not be as happy as anything’ – who is alarmed by the fact that the local butcher appears to be in love with her. She can understand why he is, of course, her being the former face of Palmolive and a woman who makes a career out of looking after herself (Felicity on ‘cell replenishment’ is priceless), but it is so terribly awkward for this pristine, flawlessly mannered woman, not least because the butcher, Alfred Chang, is of Chinese descent – a fact that Felicity finds impossible to get past: ‘Partly it was that the butcher was Chinese. She was no racist, and wanted him to know that she did not count it against him, him being Chinese. The trouble was, not wanting to be thought racist always seemed to make her too friendly.’ The simple act of buying six short-loin chops takes on epic proportions and is highly amusing, perceptive and sad. As eccentric and extreme as these three characters seem on the surface, there are Douglas’s and Harley’s and Felicity’s everywhere – people broken by the very notion of what they should be and the gap between that and what they actually are, or perceive themselves to be. For Douglas and Harley, the challenge is to overcome the fact that they are consumed by their perceived weaknesses, while Felicity will be rudely confronted by her lack of perfection. 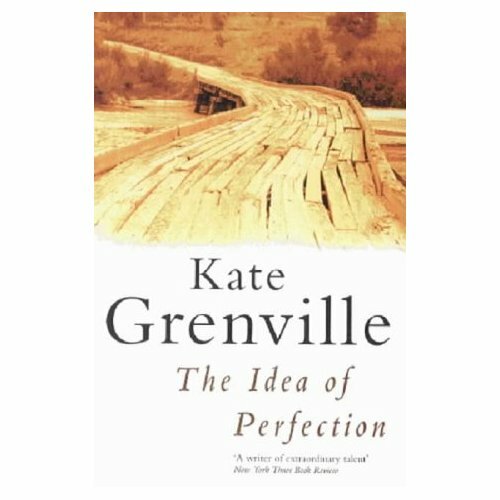 It is Grenville’s terrific attention to the raw detail of social interaction, and to the inner thoughts that plague us and drag us down, that make this book so honest and true. The story moves along slowly but is never dull – the characterisation is so compelling as to replace any need for ‘action’. It reads like a real slice of life, but makes the mundane suddenly vibrant. The Idea of Perfection is a funny, whimsical, insightful and quietly brilliant book. I really like your review. Seems like a different book. This sounds like a wonderful book! Your great review has made me want to order it straightaway. Thanks for this. Thank you so much, Violet and Mary. I was very worried about not being able to do the book justice so I’m pleased you’re interested in it. I don’t say this very often but this is definitely a book to read more than once – perhaps that’s because it’s not what happens that is important but how it happens. You certainly did do it justice. This line from your review jumped out at me and sounds so ‘right’. Brilliant review – it has definitely made me very interested in the book. I read this book awhile back, at a librarian’s recommendation and completely agree with everything Emily has said. It’s sweet and funny and touching and a wonderful read. Terrific review of it, Emily! Thank you, Luisa and Jackie. These characters are so believable and so wonderful that I already miss them! I loved this book, too, Emily! I read it ages ago and reading your excellent review has brought it all back. I would probably never have picked this up otherwise, but your review made me put this straight to my must-read list! Thanks Emily! Glad I brought it back for you, Geri. And Leena, thank you, I hope you’ll love it as much as I did. More Grenville reviews to come in the near future. Dont read this…. its painfully boring. Interesting to get another viewpoint, Rach. Any more detail? This entry was posted on August 29, 2008 by emilygale in Entries by Emily, Fiction: general and tagged Australian literature, heritage, Winner of the Orange Prize for Fiction.